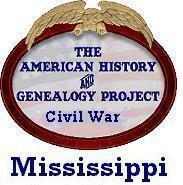 Post a query to the Mississippi Civil War American History and Genealogy Project message board or leave a comment. This form posts directly to this page on this website. If you would prefer to send a private email and not post to the internet, you may send an email to ahgpmscivilwar@gmail.com . Once you complete and submit this form, your query will appear on the Queries Page, in the chronological order it was received. Confidentiality Notice: It is important to remember that the contents of your query will be posted to a public server and therefore can be viewed by anyone with web access. If you would like to keep the contents of your query offline, you should send a note directly via your email program.